Sorry for the somewhat back-to-back wireless solutions articles but Bose recently began shipping a wonderful little mobile/wireless speaker system called the Bose Soundlink that offers incredibly nice sound in a rather small and lightweight package. With all my music at my finger-tips in my iPhone and iPad, I have previous considered getting a mobile speaker solution for when I travel or do presentations with audio that could benefit from louder speakers than my PC and have been tempted to pick up the Jawbone JAMBOX for the past year on the recommendation of a friend. But to date I haven't pulled the trigger as I do have the Creative ZiiSound D5 system at my office which is not travel friendly per se but does a great job at the work which seems to be the main place I leverage a wireless speaker solution anyway. And all three of those products are all clocking in at roughly the "$200-300 price range...so I was also curious what was out there under a $100 and keep going back to the Monster ClarityHD Percision Micro Bluetooth Speaker which seems to get rave reviews from people that have it. Creative ZiiSound D5 (Street prices around $220 / 19.6 x 3.5 x 4.3 inches and 8.3 lbs) - Rocking audio, not on-the-go size/weight, supports Bluetooth wireless connection, comes with an iPod/iPhone Bluetooth adapter, you can charge your iDevice in the integrated dock, an optional USB wireless transmitter for your computer is also available, needs to be plugged into a power outlet (no battery) and offers a built-in auxiliary input for traditional audio sources. Not small and weights more than your laptop does but can add great-quality wireless sound to any room with ease. While this is not a truly mobile device as it needs to be plugged in, it is in this write-up because it produces amazing sound and can be easily transported when needed. If you can live with the device needing to be plugged in...it is an amazing product. Note: A newer version called the ZiiSound D5x ($299) is essentially the same except for the additional support to link up to three Creative Bluetooth speakers in multi-channel mode (two D5x and a Creative ZiiSound DSx Subwoofer) to create a complete wireless audio solution throughout the room or link them across rooms to enjoy the same music at the same time. But the original D5 is still available and will save you $70+. Bose Soundlink Wireless Mobile Speakers ($299.95-$349.95 / 1.9 x 5.1 x 9.6 inches and less than 3 lbs) - The audio powerhouse is the latest entrant into the Bluetooth wireless speaker arena providing their traditional Bose quality audio executions. 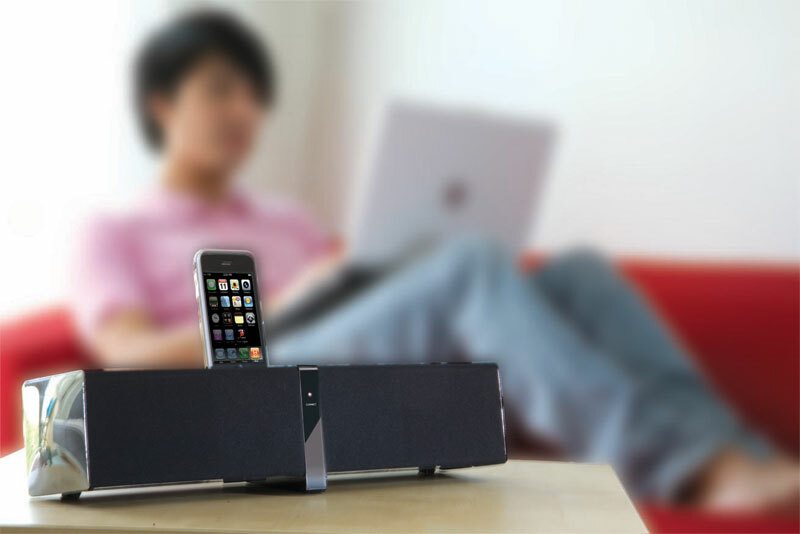 Leveraging Bluetooth, you can link your iPhone, iPad or Android device and enjoy up to 8 hours of music "on the go". 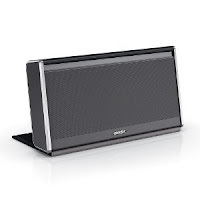 The sound lacks the full range you have probably experienced in their other Bose dockable speakers but is quite respectable for something this compact and running on batteries. Another key aspect of the Bose speakers is their 30 foot Bluetooth range. The Soundlink includes a USB port for updating the product with new features or updates. Offered in a standard grey nylon for $299.95 or in a premium leather edition for $349.95. A magnetic cover automatically turns off the speaker similar to the smart covers on the iPad2 and makes it easy to haul around. You can also get an optional cover in a wide range of colors. Overall if you are a Bose fan, you will like this solution. But the price just feels a bit steep compared to the other products featured here. Quality comes at a price! You should see the reliability testing video at the Bose website! Jawbone Jambox (Street prices around $170 / 6 x 2.2 x 1.6 inches and 12 ounces) - This small and very lightweight speaker setup definitely delivered a richer audio experience than I expected. Not in the league of the Bose or Creative but still quite respectful. It is also the most "fun" product in this line-up, available in a wide assortment of grill patterns and colors to match your personality. Jawbone claims the Jambox has a 33' range but my experiences were more like 15-20'...so as long as you plan to stay in the same room with your audio source, you will probably be fine. Jawbone's MyTalk online service continues to add new features and downloadable applications to the Jambox all the time. Compatibility includes online services like MOG, Spotify, Pandora and YouTube applications. The built-in microphone also transforms your Jambox into a very robust mobile conference call solution. This is a true multi-cast device, meaning you can pair the speaker with two devices simultaneously...allowing you to listen to music from your laptop and seamlessly switch to your cell phone to take a call. Your traditional corded audio connects through an auxiliary audio port. You also get an impressive 10 hours of music on a single charge. Monster ClarityHD ($99 / 6 x 6 x 6 inches and 1 pound) - Slightly more boxy in dimensions than the Jambox and again another step down on the audio quality versus the other devices we have here in this write-up. 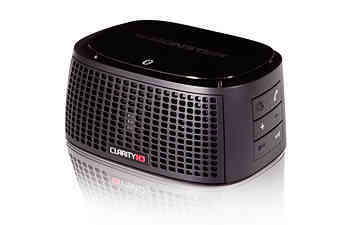 But the ClarityHD does deliver the best sound for a Bluetooth mobile device for under $100 that we have heard to date. Like the Jambox, the ClarityHD also has a microphone to hands-free conference calling. Battery life is also in the shortest at roughly 5 hours. Like the others, Monster provided a traditional 3.5mm audio input for non-Bluetooth devices. It is also a well loved product from the 100's of extremely positive reviews online. The ability to access your song selection, playlists and audio settings from your Bluetooth audio device and share the music via a quality portable speaker is a very liberating thing. Something I highly recommend now that the technology is to a level that Bluetooth wireless audio is "almost" indiscernible from a docked Apple lossless compression playback...almost! The ability to amp up your audio playback for conference calls on your smartphone, Skype, videogaming, streaming and PC applications are an added plus for those of you that are "on the go". If you are looking for walking around a room at the house with a wireless speaker solution, the Creative ZiiSound D5 is more than capable of filling a normal room with rich, high-quality sound. The Bose Soundlink and D5 audio are very comparable but the Bose adds mobility with 8 hours of battery life if that is important to you. 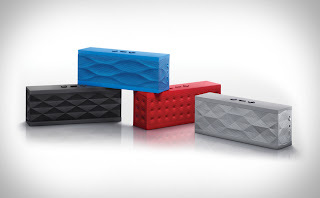 In the really mobile category, the Jawbone Jambox is small enough and light enough that you will really travel with it! This is a big deal to me. So many products have limitations that at the end of the day causes you to stop using them as the newness wares off. Size, proportions and weight are the largest detractors for a truly mobile offering. The Jambox is designed to travel while also delivering audio just a notch down from the Bose or Creative offerings while still probably exceeding the expectations for most people. For something this compact, it does deliver an exceptional clear sound. The addition of downloadable applications and a built-in microphone really make this a unique and standout product. The Monster ClarityHD is great if you are on a budget and want a terrific, highly mobile audio solution but after playing with these other Bluetooth speaker offerings, the ClarityHD overall is a bit generic for me. But it gets wonderful user reviews on sites like Amazon, so there is clearly a market for this "best in class" sub-$100 category and thus worth a look. Winner - So if you haven't already picked out my favorite here, I am really liking the Jawbone Jambox. It is an almost magical box that does a lot very well, in a small form-factor and something I can really travel with. Caveats - In a close second and if you are an audiophile you may want to move up to the Bose Soundlink. If you can live without a battery, the Creative Ziisound D5 is a powerful audio solution at a very reasonable price and my favorite to listen to in the entire bunch. While I am sticking to just the "mostly mobile wireless solutions" in this write-up, there is a whole range of home wireless options leveraging iTunes, Apple's Airplay or Sonos solutions that I have not included in this article and they deserve their own review in the coming weeks. This category of product will typically be a bit more complicated to setup and definitely are much more expensive to implement. Please follow me on Twitter or Facebook and if you like any of the products, please consider purchasing them through my links (most @ Amazon). If nothing else, the funds I generate off the site go to buying and testing other great products.